Writing reviews, I usually only get to watch the first couple episodes before issuing judgment. While early episodes can give a sense of where a series is headed, it’s not always clear if even the most promising of premiers in September can stick the landing in May. So let’s take a look back to see how some of the shows we’ve been watching this season fared. For the sake of (relative) brevity, I decided to break this recap into two parts. This week: drama. Spoilers ahead, obviously, so read with caution. 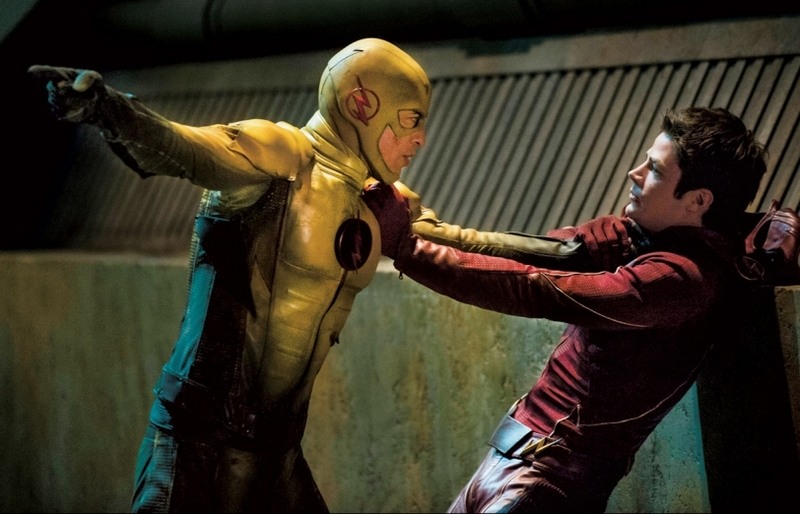 In a season that was saturated with superhero dramas, The Flash was easily the strongest of the pack. Taking a lighter tone than its network sibling Arrow, the series dove headfirst into the DC toy chest, expanding the universe it and Arrow share by introducing a number of super-powered characters and quickly building up a rogue’s gallery that was equal parts menace and camp. The frequent crossovers between shows also helped to show connectivity, even if it created some continuity issues week to week. Despite 23 episodes, the series rarely lagged. Sure, some episodes were duds, but showrunner Greg Berlanti and company had their eyes on the long game, building a head of steam as they raced to the most cliffhanger-iest finale I’ve seen on TV in some time, with the Flash literally running into a black hole over Central City. Now that Iris knows Barry is the Flash, one of my major gripes about the show is out of the way. And her admonishment of both Barry and her father for keeping her out of the loop to protect her worked toward making her a character in her own right, rather than one defined by the men surrounding her. After such a strong debut season, The Flash will have a lot to live up to next season. With the premier of Legends of Tomorrow — yet another series set in the same universe featuring many of the same characters — there is a risk that all three might be stretched all too thin. Here’s hoping they can manage the load because, right now, it’s a hell of a lot of fun. This was an uneven season for Arrow. Previous seasons benefited from having an antagonist with a clear objective (Merlyn, Slade). This season, however, Ra’s al Ghul (Matthew Nable) presented a complicated but uninteresting and ambiguous big bad for Oliver Queen and company. Oliver’s (Stephen Amell) apparent death at Ra’s’ hand made for a great mid-season cliffhanger, but the back half of the season did not maintain that level of drama or tight plotting as it got mired in a convoluted scheme to force Oliver to take over for Ra’s as leader of the League of Assassins. Brandon Routh as Ray Palmer, a.k.a. Atom, was a tepid addition to the cast creating a forced love triangle between him, Felicity and Oliver that was only ever going to end one way. Outside of that triangle, Routh is pleasant enough, if somewhat bland, as a swagger-less DC version of Tony Stark. I’ll be interested to see how his character develops over on the Legends of Tomorrow spinoff this fall. Buzz around season four promises a reboot of sorts, picking up where three left off, with Oliver hanging up his bow and pursuing a normal life with Felicity. After this season, such a shakeup may be just what this show needs. The dependable workhorse of the Marvel Cinematic Universe, Agents of S.H.I.E.L.D. wrapped a solid second season that was a vast improvement over the first. Much of this season dealt with disposing of the remnants of Hydra and exploring the mysterious Inhuman race. That latter plot kicked into high gear in dramatic fashion in a strong midseason finale, with the reveal that Skye, a.k.a. Daisy (Chloe Bennet), was an Inhuman. The back half of the season, then, dealt with the fallout of that reveal, which was dragged down at times by the continuing power struggles within the newly rebuilt S.H.I.E.L.D. Agents of S.H.I.E.L.D. remains one of the most diverse and interesting casts of any genre show out there. Those looking for strong female characters in superhero franchises will find them all here. Fortunately, season two saw some welcome progress in character development. Once Skye got her powers, her character finally began to become more fleshed out. As Bobbi Morse, Adrianne Palicki was also a kickass addition. Similarly Agent May (Ming-Na Wen) finally gets a backstory that goes a long way to adding some depth to one the series’ best characters. Also much improved were action sequences and fight choreography. With more superpowered characters, the show has been able to cut loose (within a TV budget) with the action. A single-shot fight between Skye and a team of Hydra agents echoed the much-discussed single-shot brawl from Daredevil. While the former lacked the intensity of the latter, it was still an exciting, fun scene the show needs to stage more often. But despite these improvements, the series still suffers from being too bland. That fact was especially evident this season when Agent Carter and Daredevil demonstrated just how stylish and damn good Marvel TV shows could be. Judging by the finale, we’ll be seeing more Inhumans in season three. It also looks like Skye will be heading up an Avengers-style team of her own, as the series seems to be going in the direction of Jonathan Hickman’s excellent Secret Warriors comic. This is exciting news. My one wish is that Agents of S.H.I.E.L.D. would cut its episode order in half and use the extra money in the budget to bring in more Avengers cameos from the MCU. The show’s occasional overlap with the greater universe is fun but too infrequent, with Coulson’s team working in isolation with only passing references to larger events. An appearance by Chris Evans or Scarlett Johansson doesn’t come cheap, but fewer episodes would have the dual effect of paying for Avenger cameos and tightening the show’s overall plot. It was almost unfair for ABC to premier Agent Carter in the Agents of S.H.E.I.L.D. timeslot during its winter hiatus, as the juxtaposition did the latter no favors. The 1940s spy drama had all the high-flying daring-do and stylized spycraft “Agents” has only managed to achieve intermittently. Overall, Agent Carter was strong and well written. While the feminist politics and sexism got a little heavy-handed in parts, the show never buckled under its weight. However, the shift in focus to Howard Stark (Dominic Cooper) oddly put the show’s titular character in the passenger seat for the back half of the season. My only minor complaint is that the show didn’t go bigger. Aside from one mission to Russia, the action transpired in and around New York. Hopefully, season two will up the ante by exploring more of the Silver Age MCU. OK, so Sleepy Hollow isn’t really a superhero show, but it does fit into the broader genre category. After such a strong, weird first season, I was optimistic Sleepy Hollow would keep on surprising me. Unfortunately, the combination of a larger episode order and burning through so much story in season one resulted in too much wheel spinning and plot detours. The addition of Hawley (Matt Barr), an artifact dealer with occult ties never really gelled with the core cast. His presence felt like scruffy beefcake window dressing, presenting a potential love interest for Mills (Nicole Beharie) while adding little to the show’s main story. Tom Mison and John Noble remained enjoyable as always as the age-inverted father-son pair. Both actors have the chops to make this show’s inherent ridiculousness work. However, their familial arc falls apart toward the end of the season as Katrina (Katia Winter) takes a too-abrupt turn for the dark side that fails to deliver on any real conflict or suspense. Hopefully, new showrunner Clifton Campbell can right the ship for season three and recapture the excitement that made this show so much fun to watch. After such a fantastic, tightly plotted and deliberately paced season — easily the best since season one — I was fearful going into the homestretch that “The Walking Dead” might revert to its meandering, erratic status quo. While things didn’t completely fall apart, the finale did squander a lot of the complicated character development the show had been building all season long. Team Rick seemed poised for conflict with the gentle residents of Alexandria, presenting a quandary for viewers as heroes like Rick began to resemble villains from past seasons. How far down the left-hand path would showrunner Scott Gimple let him walk?